In August 1975, near the small island of Sinan-gun in South Jeolla Province, off the southwest coast of Korea, a fisherman found six celadon objects in his fishing net. 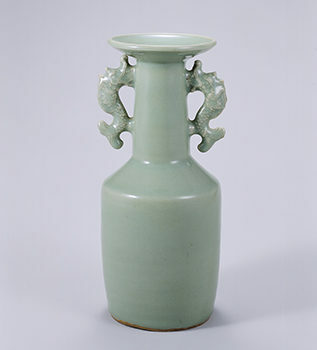 These celadon objects were made from Longquan kilns in Yuan China (1271-1368) and were put in the sea by the Sinan shipwreck. The Sinan ship was a 14th century trade ship that left Ningbo, China, for Hakata, Japan, and the discovery of these objects revealed the Sinan shipwreck to the world. From 1976 to 1984, underwater excavations recovered a total of 24,000 pieces, including ceramics, metal, stone and wooden objects, and lacquer wares. This talk will explore the various items recovered from the Sinan shipwreck that help us understand the material culture of maritime trade between China and Japan and discuss the popularity of Chinese objects in medieval Japan. Through a close reading of contemporary visual and written sources from medieval Japan, the talk will also examine how these recovered objects were used in diverse contexts and settings, such as temples, shrines, and elite residences. Jungeun Lee is a Robert and Lisa Sainsbury Fellow at the Sainsbury Institute for the Study of Japanese Arts and Cultures. She is currently working on a book, From Authority to Commodity: Formal Display in Premodern Japan, about the multifaceted meanings of the Ashikaga collection and its interior display. Her research interests include formal interior display, visual and material ornamentation in architectural settings, court and shogunal patronage on arts and their collections, and the inter-cultural relationship among the arts of Japan, Korea, and China. Dr. Lee received her PhD in History of Art and Architecture from the University of Pittsburgh. She has held fellowships from the Andrew Mellon Predoctoral Fellowship and the Korea Foundation, and before coming to the Institute, she worked at the Metropolitan Museum of Art and the National Museum of Korea.